Rarely do acts of civil disobedience come in such grand fashion as Taiwan's Sunflower Movement and Hong Kong's Umbrella Movement. The two protests came in regions and jurisdictions that many have underestimated as regards furthering notions of political speech, democratisation, a... read full description below. 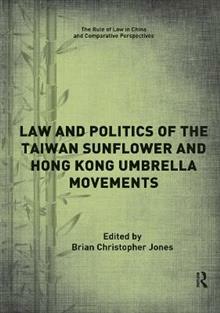 Brian Christopher Jones is Lecturer in Law at the University of Dundee, UK. He was previously a Postdoctoral Research Fellow at Institutum Iurisprudentiae, Academia Sinica (Taipei, Taiwan). His research interests are in comparative public law, specifically constitutional and administrative law, socio-legal studies, democratic theory, civil disobedience, and law and technology. He has published widely on these and related areas.